Gold prices have surged roughly 1.25% to the $1,320 area over the past week. The market was lifted by a weakening U.S. Dollar and global safe-haven demand, that has come about even though the S&P 500 enjoyed a strong January. There was some selling pressure Friday after the U.S. labour market showed strong growth in January, according to the latest government employment data. On Friday, the U.S. “Labor Department” said 304,000 jobs were created in January. This may have been short of some expectations; but according to consensus forecasts economists were expecting to see job gains of around 165,000. However, some of the enthusiasm in the labour market was been tempered after significant revision to December’s employment numbers down to 222,000 jobs. The first takeaway is that job creation continues to expand, but please do note that at the moment wage growth remains tepid with average hourly earnings increasing just 0.1% in January so falling shy of expectations pitched at 0.3%. The wages picture could be argued is not good for gold as the lack of wage pressure keeps the Fed on a neutral track; therefore, no inflation hedging is required. However, I read the market condition as saying the labour market slowly turning up the tightness and I can see further rate hikes down the line. 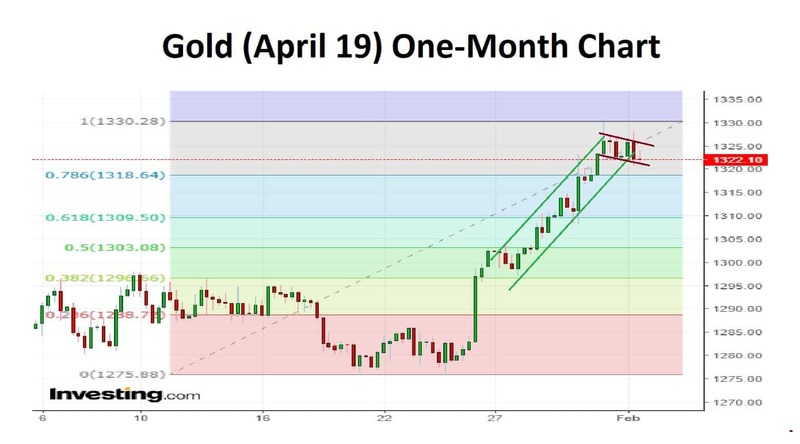 Gold has an even split on the technical sentiment with strong selling marking the mood out to five hours and then new buying emerging out to the start of March. I am looking to sell at the opening at the small corrective channel builds with a target of 1303 in mind.